According to Wikipedia, Sukhothai was once a thriving Kingdom in central Thailand and translates to "dawn of happiness". There’s something wishful about using that name for a restaurant: hoping to bring happiness to all your customers. By no means am I implying this is why the Ottawa owners chose this name, it’s simply my own romantic notion. Tomato and red spices are left out of the restaurant’s tom yum goong ($5.50) so the broth remains clear … rather deceiving … until you take a sip. Instantly, the spicy, sour, salty and even mildly sweet flavours flood the mouth – how is such an innocent looking soup so powerful? Even without the red spices the soup has a nice heat level and lemongrass essence. As a warning, it’s a tad salty so this goes best with rice. Green curries are one of my favourite Thai dishes and Sukhothai’s doesn’t disappoint. The gang keaw warn ($16.95) has great rich flavours and the sauce light enough to spoon liberally over rice. The mixture of crunchy vegetables (bell pepper, carrot, bamboo shoot and baby corn) kept it fresh and the drizzle of extra coconut milk on top an additional creaminess. I’d caution against ordering the beef as it was a tad chewy, I still enjoy this dish best with chicken, shrimp or simply in its vegetarian form. 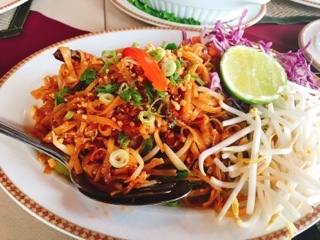 If you can’t handle spicy curries, the gang khua sap pa rod ($18.95) is a safer alternative. 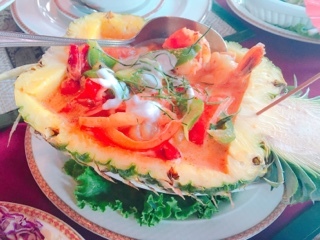 Coconut milk, tomatoes and curry are combined with shrimp and chunks of pineapple. The sweetness from the fruit mellows everything, making the dish a mild approachable curry. 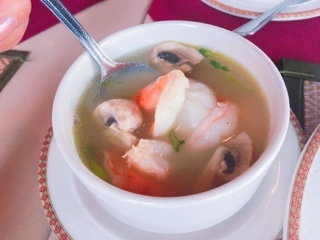 The shrimp's texture is different: not the crunchy consistency found in other dishes; something about the acid makes it meaty and tender but not rubbery. 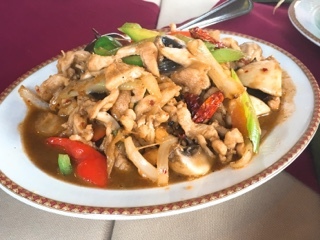 If you thinking the gai pad med ma muang ($15.95) is like kung pao chicken, then you’re correct. 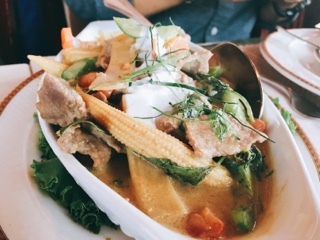 This Thai dish is said to be derived from the popular Sichuan version, except substituting the creamier cashew for peanuts and incorporating a stronger heat. Overall, the cashew chicken has a decent spiciness but not overwhelming. During the warmer months, a lighter cold dish such as the yum-pla ($17.95) is ideal. 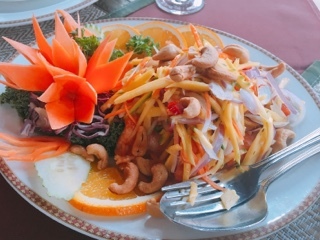 Despite the menu noting this Thai salad is generally served as a hors d’oeurve, it’s so substantial that you should consider it a main. A large piece of grilled trout is topped with green mango salad and cashews for crunch. Sukhothai’s pad Thai ($15.95) was the first I’ve had that grinds their peanuts into fine pieces so you experience its texture without too much crunch. 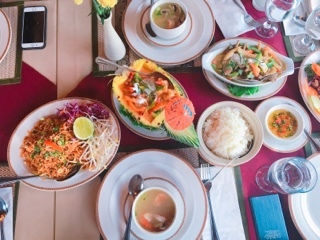 Overall, a good rendition of the popular dish: the stir-fried rice noodles were springy and well covered in spices without becoming too wet; the chicken and shrimp not over cooked; and the bean sprouts and red cabbage served on the side so you can customize the amount of crunchy raw vegetables. To end, we were treated with a dessert typically only served on special occasions. The thong ek, which translates to “gold prime”, is meant to bring wealth and advancement with a person’s career. 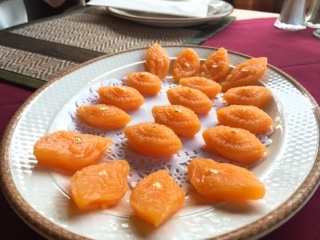 The dessert is generally carved into a flower shape; at Sukhothai, they’re simplified into a leaf beautifully adorned with a piece of gold foil. Made with sugar, coconut milk reduction and egg yolk, the thong ek reminds me of Chinese New Year cake, except softer and stickier. Sukhothai, being the last restaurant we went to that day, was a great ending. Not exactly the “dawn of happiness”, but I certainly departed in good spirits having enjoyed a lovely indulgent meal with a group of great people.